Designed for both beauty and functionality, the WAF141A.BA0813 TAG Heuer Aquaracer Quartz Women’s Watch is a fun, sporty timepiece with a feminine appeal. 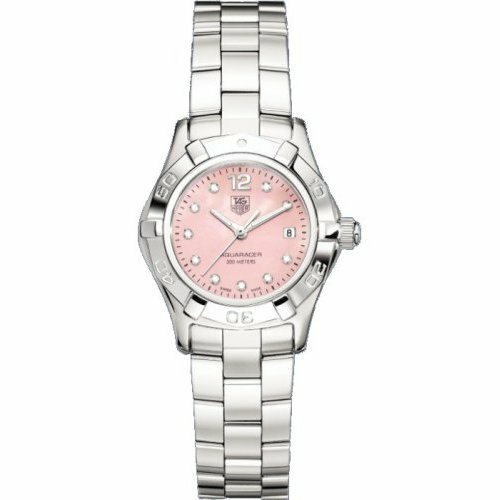 The luxuriously pink mother-of-pearl dial that tops this fashionable watch is set with 10 round diamonds which appear in each numeric position but 12 and 3. The 12 appears as a polished, silver Arabic numeral while the 3 o’clock position displays the date. The bezel of this aquatic timepiece is set with 13 Wesselton diamonds between numerals appearing in the same fashion as the 12 on the watch-face. The functionality of this diving watch is increased by an extension system which allows the polished steel bracelet to fit over its owners wet suit. The double security clasp also ensures that this watch will stay put during a long dive. The TAG Heuer Aquaracer Quartz Women’s Watch features a sapphire crystal with a scratch-resistant finish and water resistance to 300 meters which is ensured by its screw-down crown and case back. The case of this sturdy watch is stamped from a solid piece of steel and has a 27 mm diameter. Its back features a charming diving bell decoration that is stamped into the metal. The design of the TAG Heuer Aquaracer Quartz epitomizes sporty functionality for the active woman.